For the last few years, Bobby and Tiffany Peppard create a beautiful Christmas Display in memory of Bobby's little brother David, who passed away in November of 2007 from cancer at the age of 16. They host the display to spread Christmas joy and raise awareness of childhood cancer. While viewing the display is free, donations are accepted and 100% of proceeds go towards the Wishes Can Happen Organization. I had an opportunity to check in with Bobby Peppard to ask a few questions about their display Enjoy! What are your favorite aspects of the display? Our favorite aspect is the variety of items we have. We have everything from lights to wooden cutout of your favorite themed characters to blowups which range from small 4 foot ones all the way up to 8+ foot ones. Have you added anything new for the 2013? We have added 10 blowups and a couple thousand more lights since 2012. How many years have you been hosting the display? This is the 2nd year we have taken donations, but we have decorated to an extent for years. How long does it take you to set up each year? Last year we had about 35-40 hours of set up time, and we are around the same time this year as well. You mentioned that you do it in memory of your brother. What make you choose Christmas Lights as a way to remember him? Growing up our parents allowed us to decorate outside for the holidays. 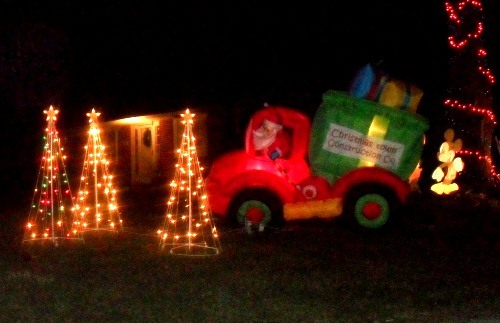 By no means was it 16,000 lights and 40 blowups, but it was enough to make Christmas fun and exciting for Mom and Dad's 4 sons including David (my late brother) who always enjoyed decorating with us. Since getting married my wife and I love doing this and dedicate every year to help raise awareness of childhood cancer and the struggles it puts a family through. What charity are you collecting donations for? We chose Wishes Can Happen as the recipient of the donations every year because it is the local based group to the national “Make a Wish Foundation”. The reason Wishes Can Happen is meaningful to my family is because David's wish was to go to a Cleveland Indians game, he got to go behind the scenes and meet all the players, watching batting practice, and we had front row seats to the game. The average cost to grant a child's wish is almost $4,800 because the entire family gets to go with them. More information on this organization can be found on their website, www.wishescanhappen.org. Facebook: Click here to visit their website for more details and pictures of the display. And if you visit be sure to take pictures while you're there and share them on the facebook page. 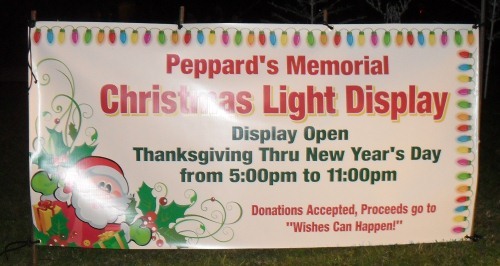 Our family really enjoyed the Peppers Memorial lights. Our 2 children age 1 and 4 loved running up to each inflatable. They asked if they could have this done to their yard. We are glad you enjoyed it. We have expanded the display this year! Be s7re to spread the word!